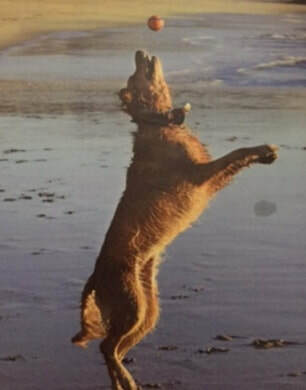 "Calli was an active, happy dog who enjoyed playing with her younger adopted brother Curry, going to the beach and fetching balls. When she was fetching, she was driven to get the ball and return it as quickly as she could. She would ignore all other dogs while she was playing this game, unless they got in her way or got her ball. In that case she would patiently wait for the other dog to lose interest in the ball, but she never confronted the other dog in trying to get it back. I took her and Curry to a dog park one day for some exercise, and started playing fetch. After I threw the first ball, she gave chase with her usual manic pace, and fumbled the first attempt to secure the ball in her mouth. The ball bounced off in a different direction, and just as quickly she changed her direction, as well. All the while another larger dog was chasing her and the ball, and when Calli changed direction they collided, and she went down yelping in pain. After just a few seconds she stopped yelping, and seemed not to be in pain at all, but she couldn't move either of her hind legs. With the help of other people in the park we called our vet who sent a technician to help get her to the veterinary hospital, where she spent the next four days. By then she had regained some control of her left leg, and the hospital staff would use a sling in order to go outside for elimination purposes. They would partially lift her left leg off the ground enough to use it while dragging the other behind her. After a couple of days we took her to a Sage hospital to see a neurologist who determined that she had either an intervertebral disc disease or Fibrocartlaginous Embolism. We decided to treat for the latter unless it became necessary to start treating for the former. After a few more days, we started getting Physical Therapy from Dr. Ilana and Kimi at A Well Adjusted Pet. They treated her with a Loop device that projected an electromagnetic field (which we purchased for home use). The other treatments were Hydro-therapy, using a treadmill in a water tank to work on her gait, and Laser lamp therapy to aid the healing process for her spine. After five sessions of this we signed up for five more with just the Hydro-Therapy sessions. All this while we did home Loop treatments, massages, and leg motion exercises. Also, we set up a course of broomsticks to allow her to practice lifting both hind legs a few inches off the ground over the broomsticks. At the current time she is doing quite well with all the exercises plus neighborhood walks."